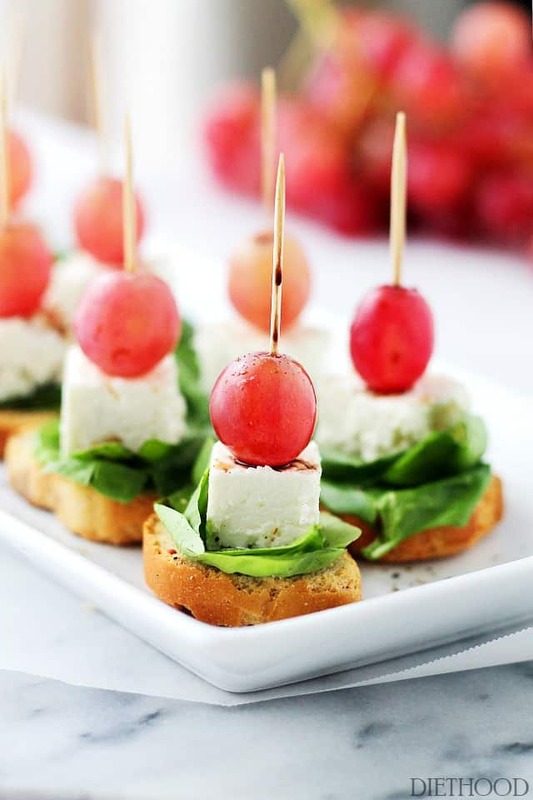 Macedonian-Style Grape Caprese Salad – This light, fresh appetizer-salad is made with red grapes, feta and spinach set atop slices of garlic toast. Happy Wednesday! Hope you’re having a fantastic week!! I’ve been building up to this moment. I am SO excited to tell you about this recipe! Thank you, California Grapes, for sponsoring this post! I’ve been waiting for those beautiful California grapes to arrive and for the French Feta (it’s as close to the Macedonian Feta as you can get) to appear at our local deli. Thankfully, grapes from California are in season May through January, and my deli-guy just brought in my favorite French Feta. When I’m looking through my refrigerator to determine what my next creation is going to be, it can be a very tough decision. There’s a very specific strategy that I go through every time I stare into my refrigerator, trying to figure out where to go from there. But, when I find a beautiful cluster of red grapes in the fridge (Yes, I keep them in the fridge because I LOVE cold grapes! ), I just eat ’em on their own. Crunch, crunch, crunch… gone. 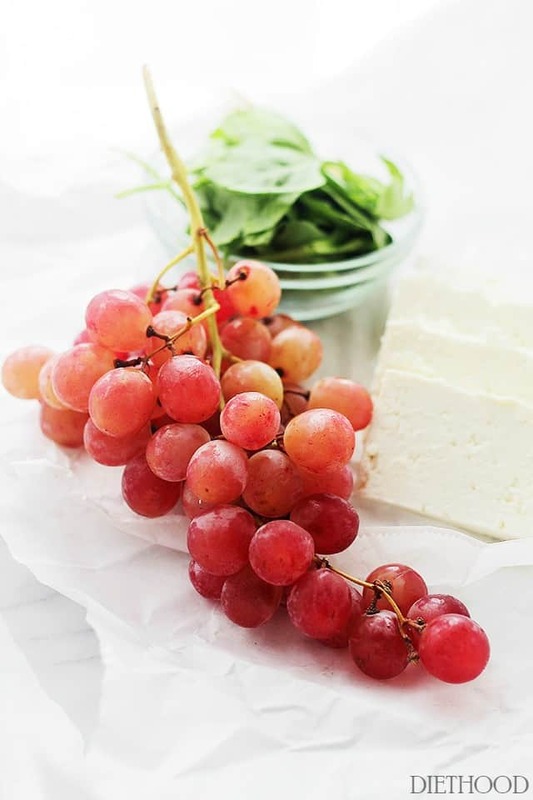 Grapes are so satisfying and so delicious on their own, but they are also perfect to mix into salads, sandwiches, smoothies and into my delicious grape caprese recipe! Did you know 99 percent of the commercially grown table grapes produced in the United States are from California? For generations, growers throughout California have been harvesting fully ripe grapes, ready for snacking and mixing into your favorite recipes. But, did you also know that grapes of all colors – red, black and green – are a natural source of antioxidants and other polyphenols and are an excellent source of vitamin K.
Basically, what I’m trying to say is that I love ’em. Grapes are a super healthy snack, ideal for eating anytime, anywhere. Snacking is the main way I use fresh grapes. The next thing I like to do with grapes, is make this delicious Grape Caprese Salad! Lucky for you, you might have just stumbled upon the most perfect grape salad. Seriously. This is the stuff! I grew up on a variation of this salad. My mom always served it at dinner parties and would sometimes make it just for us, to simply snack on. Everything is stacked and layered perfectly. Garlicky, crispy toast, fresh baby spinach, salty feta and red, delicious California grapes. All drizzled with a simple vinaigrette. Sweet and salty. Totally seasonal. Crisp and creamy. This appetizer salad has it all! For more information, please find and follow Grapes from California on Facebook, Pinterest, Twitter and YouTube. 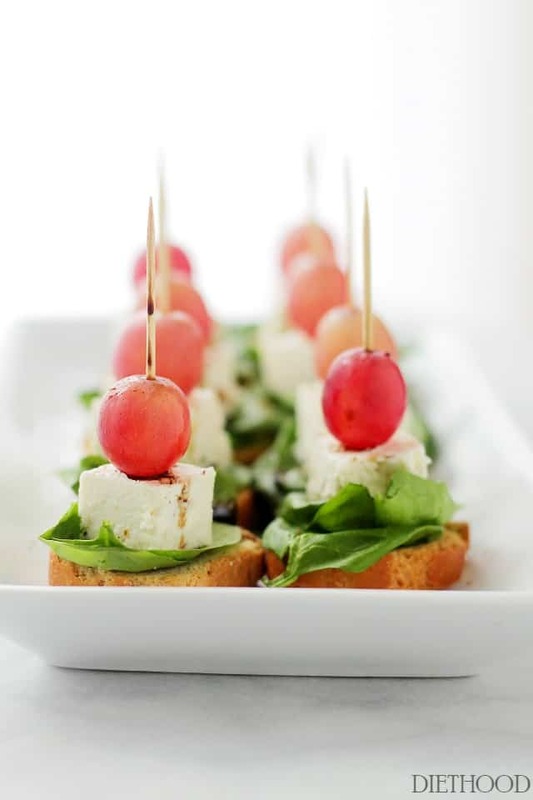 This light, fresh appetizer-salad is made with red grapes, feta and spinach set atop slices of garlic toast. Place toast slices on a serving platter. Layer two leaves of spinach on top of toasts. Set Feta over spinach leaves. Using the skewers, poke the top middle of the grape with the skewer and push all the way down, securing it all together. Crack fresh pepper over each skewer. These look scrumptious. I want to open a bottle of wine and have a one woman cocktail party with a plate of these! These look so pretty. A nice addition to any table. Thanks for sharing. I pinned. I hate raw tomatoes so I love this take on a caprese salad! 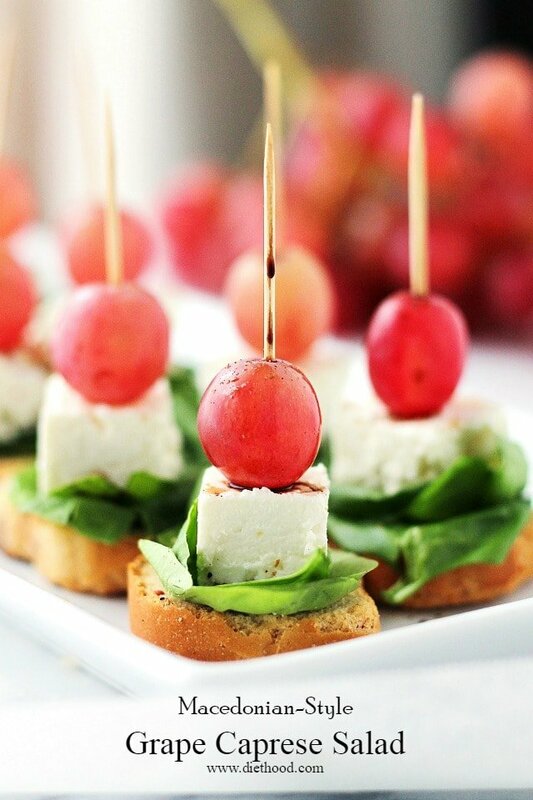 So pretty, what a perfect holiday appetizer! So beautiful! And I love the use of grapes….such a great party app! Wow, these are right up my alley! 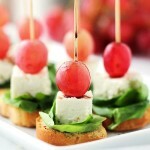 I love this idea and this just got added to must-try list of appetizers! Gorgeous! These would be show-stoppers on any party! Pinned! These look great Kate and beautiful photos.